This Christmas I received a fair few fragrances; a couple of my old favourites and some new additions to my collection too. All four of these perfumes are now my must-haves and I'm sure I will keep repurchasing them time and time again. The thing I've noticed since building my collection is that Jo Malone perfumes, no matter what the size, always last longer than other brands. When I got gifted the White Jasmine and Mint Cologne I was ecstatic as it had been on my wishlist for many months. Although the scent is described as English countryside garden, which couldn't explain it better, it is the perfect year round fragrance as it's fresh enough to be worn in the Summer, but the concoction of scents makes it very suitable for Winter too. I've had my eyes on the Paco Rabanne Olympéa for some time now after I spritzed it in store and it lasted all day long. Tom was kind enough to buy it for me in the Christmas sales and I've been smitten ever since. It's one of the hardest scents to describe but it has notes of salty vanilla, green mandarin and cashmere wood which all deliver a grown up, lingering fragrance. 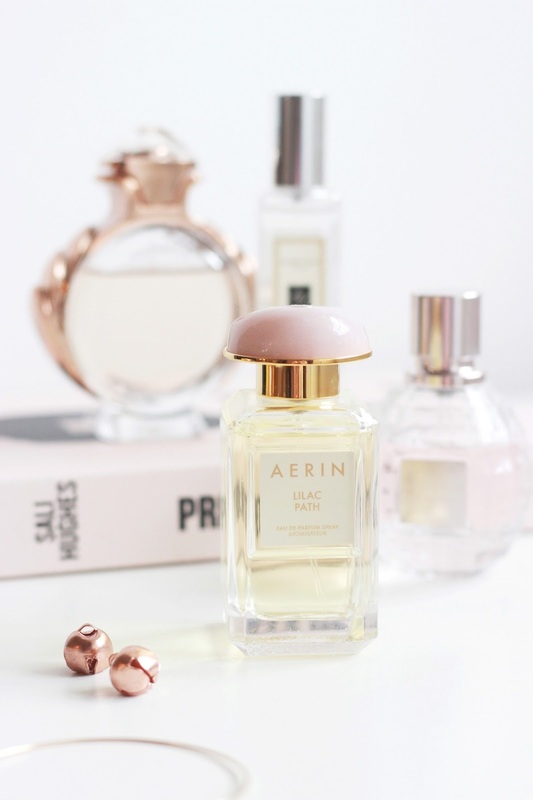 The dreamiest scent I've ever owned is the Aerin Lilac Path and I no doubt will do a whole post featuring this perfume at some point too. It's super fresh, whilst still remaining mature enough to wear daily. With a blend of crisp green, rich blooms and delicate petals, this floral offering is exactly what it says on the tin - Plus the exterior is aesthetically pleasing with a precious stone on the lid. It's the perfect Spring scent and I am definitely going to save this for the sunnier months. I've repurchased the Viktor and Rolf Flowerbomb many times as the sweet, floral scent always lures me in. It's very soft to wear so it makes for a great everyday perfume because although it's subtle, it still lingers on the skin for hours.